The Great Lakes and St. Lawrence Seaway offer maritime history to rival the east and west coasts. The Bruce Peninsula is Southwestern Ontario's northern point, from which you can take a ferry boat to Manitoulin Island from Tobermory. Perhaps the Bruce Peninsula's major feature is The Bruce Trail, Ontario's longest and most popular hiking trail. It is 780 km (484 mi.) long and extends the length of the Niagara Escarpment from Queenston Heights north to the cairn overlooking Little Tub Harbour in Tobermory. Tobermory also has the Fathom Five National Marine Park of Canada, famous for its scuba diving. Owen Sound offers the Billy Bishop Heritage Museum where you can learn more about Canada's World War I flying ace and for the art lover, you can check out the Tom Thomson Memorial Art Gallery. Sauble Beach on Lake Huron has spectacular sunsets and clear skies for great star gazing and there's a fabulous sandy beach to enjoy. If you are in the region on February 2 make sure to check out Wiarton Willie to see what his prediction is for spring. 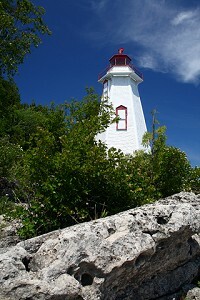 Bruce Peninsula accommodations include hotels, motels, resorts, bed and breakfasts and campgrounds. This Motel is located in Kincardine. Free WiFi is available throughout the property and free private parking is available on site. A flat-screen TV is featured. Located in Kincardine this hotel offers an on-site bar complete with karaoke and billiards. All rooms include free Wi-Fi and continental breakfast. Cable TV is featured in each room. Tea and coffee-making facilities are provided. All rooms are equipped with a fridge and microwave. A business centre complete with fax and photocopying services is available. This Hotel & Suites Kincardine offers a convenient location and comfortable accommodations. Amenities including free high-speed, wireless Internet access and a 24-hour Business Centre. Enjoy swimming with an indoor saltwater pool and whirlpool. A 24-hour Fitness Centre lets you workout any time of day. Enjoy free breakfast. The Suites in Kincardine offers an ideal destination for homelike extended stays. Modern rooms and suites. We feature complimentary Wi-Fi and fully equipped kitchens. Free breakfast buffet. We have a fitness center and indoor pool. This Kincardine hotel is conveniently located at the intersection of Highway 9 and Highway 21 in Kincardine, Ontario. Hotel guests will be close to activities such as fishing, snowmobiling, golfing and the area's beautiful beaches. Each newly renovated guest room features cable satellite television and high-speed Internet access. Located on across from the Marina in Kincardine, this hotel is just a few steps from the beach. The fully equipped suites offer the latest in amenities and all have a verandah with a view. This Inn now has a total of 30 spectacular suites to make your lakeside getaway the most comfortable and enjoyable you’ve ever had. Complimentary Continental Breakfast. Kincardine Labyrinth Peace Garden is a 20 minute walk from this Kincardine motel. The motel features a seasonal outdoor pool and guest rooms include cable TV. The rooms include a microwave, fridge and coffee-making facilities. The inn also provides each room with individual climate control. Located 2 km from Lake Huron this Kincardine motel features an outdoor pool. Every room offers free Wi-Fi and cable TV. A fridge and coffee-making facilities are provided in the rooms at the motel. Most of the rooms feature a fully equipped kitchenette. Guests can use the barbecue facilities and relax on the picnic tables. The motel also offers a children’s playground. Situated on 100 acres of forest, this scenic Lion’s Head bed and breakfast offers a daily homemade breakfast and free Wi-Fi in every room. The B&B offers rooms with a common family room for lounging. The rooms are fully carpeted and temperature-controlled. A wood burning fireplace and a terrace with forest views are offered to guests. This Bed and Breakfast in Lions Head offers gas fireplace, wide screen, flat screen TV,formal dining room and wireless internet. Complementary tea and coffee,Queen size beds and 4 bedrooms, 3 en suite. This Bed & Breakfast is centrally located in Lions Head offering a unique and memorable stay. The ideal location with three spacious rooms with ensuites. All guest rooms are equipped with flat screens and a separate guest sitting area in the main area of the house. Wifi is available in all guest areas and around the property. Full gourmet breakfast. Guests have access to the following facilities at this Hostel in Lions Head. Fully-equipped guest kitchen, complimentary coffee and tea, shared bathroom facilities. Private lockers and laundry facilities, patios & BBQ and 24-hour access and on-call staff. This Lions Head Bed and Breakfast specialize in making sure guests are taken care of. We offer spacious rooms, private ensuites and spectacular breakfasts. Our facility is pet free and adults only. Located in Meaford, this bed and breakfast serves a full breakfast and has a seasonal outdoor pool with a hot tub. A DVD player and an en suite bathroom are part of each uniquely decorated guest room. The bathrooms have heated floors and are stocked with a bathrobe and slippers. Guests can play table tennis in the game room or work out in the fitness centre. Meaford Motel and Restaurant welcomes you the four seasons resort town of Meaford. We offer clean, comfortable rooms located in downtown Meaford. The harbour, beaches, town hall, opera house, community centre, curling club and shopping are all in the walking distance. Blue Mountain and Talisman Ski-Hills are 20 minutes away. Our Restaurant has been voted for serving the best breakfast in town.